If your home water supply is from a well, Master Plumbers of North Carolina provides well pump installation, repair, replacement and maintenance services for all types of systems in Greensboro, Winston-Salem, High Point, and surrounding areas in the Piedmont Triad of North Carolina. Access to clean, drinkable water is a basic necessity, and Master Plumbers has the knowledge and experience to provide it to homeowners and rural businesses. Holding a general contractors license from the State of North Carolina means that not only have we worked extensively on well systems, but we have installed numerous systems for homes that we have actually built. 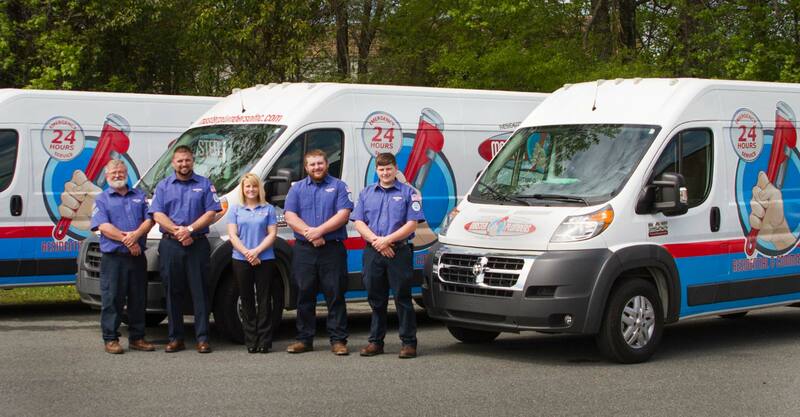 Call us today and one of our friendly plumbers will be able to talk with you about any well services that you may need. In the Piedmont, North Carolina area, there are a couple different types of well pumps that are commonly used – jet pumps and submersible pumps. For homes that have a shallow water table of around 20 or 25 feet, a jet pump is most commonly used to create suction, similar to how a straw works to draw a beverage, to pull water into your home or business. Jet pumps are often mounted in your crawl space, well house, or a basement. Many homes must drill down deeper to get access to the water table. While a jet pump can still be used in these cases, a better option is to install a submersible pump. These pumps push water up into homes as opposed to creating suction like the jet pump. This method makes submersible pumps a more efficient option. It is important to note, however, that submersible pumps need to be installed deep in the well, which makes repair difficult. Submersible pumps tend to last longer than jet pumps, so repairs are usually minimal. Master Plumbers has years of experience working with all different types of well systems and pumps. We can talk with you about which type of pump would work best for your home and then recommend some of the leading systems on the market for you to consider. Our team of highly trained plumbers will install your new well pump components so that they work well and will provide your home with plentiful, potable water for years to come. Master Plumbers also provides well filter systems that treat hard water and other common issues. Give us a call if your current pump isn’t working well and we can talk with you about our pump replacement services. Well pumps are generally very reliable, but just like any other piece of equipment, they can break down and have problems. If any of these common issues happen to your system call Master Plumbers of North Carolina for professional pump repair services. Well Pump Motor – There are a couple common motor problems. A bad starter switch will prevent the motor from actually starting up. Well Pump Electrical – Sometimes the wires powering the motor can come loose or start to deteriorate. If the issue is not related to the electricity actually getting to the motor, then it likely is the motor itself. No Water – If the well pump motor starts up but water still isn’t coming into your home, there could be a couple of different issues. Your pump may have lost its prime, the foot valve or strainer may be clogged or, if it’s very cold where you live, the pipes might be frozen. Well pump repair should only be handled by a highly trained professional plumber. Not only is the supply of water to your home critical to your health, the equipment is also expensive. Please call the professionals plumbers at Master Plumbers of North Carolina to perform any well pump repair services for your home. One of the best ways to ensure that a well pump operates efficiently and consistently is to get it regularly serviced and maintained. To see our Preferred Customer Service Agreement here. Master Plumbers offers complete well pump maintenance services in Greensboro, Winston-Salem, and High Point, NC for all different makes and models. Our technician will come out to your home and conduct a thorough inspection and tune-up on your system, clean out the well pump and look for any developing problems. This could reduce need for repairs, extend the life of your pump system and increase its efficiency. If you have a well system for your home or business, call the professionals at Master Plumbers of North Carolina at 336.676.5544.